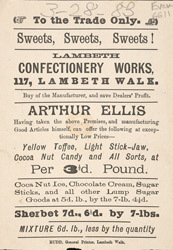 Sweets and confectionery were very popular with adults and children alike in the Victorian period. A confectioner’s window was always brightly lit and filled with jars of colourful sweets in rows. While sweets were relatively inexpensive, not every village had a confectioner’s store.